Giraffe Pin – One of the coolest, smallest boards we’ve ever seen! « Adafruit Industries – Makers, hackers, artists, designers and engineers! 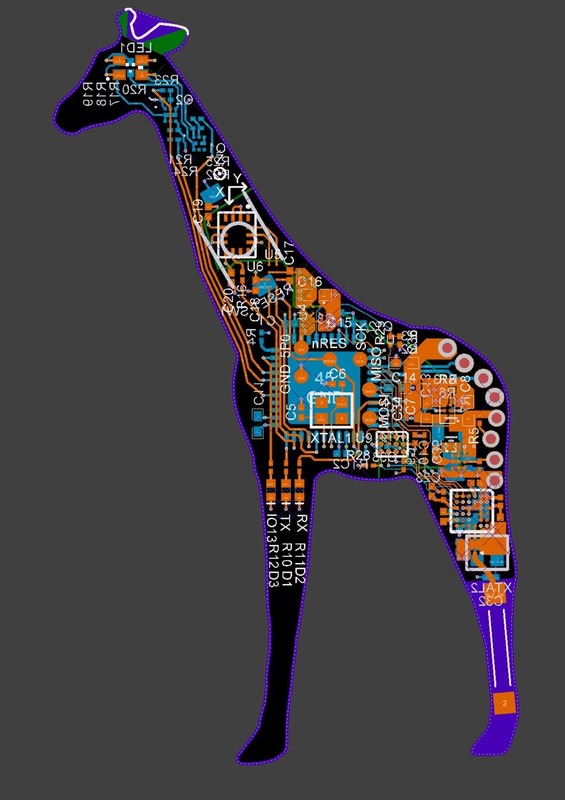 Giraffe Pin – One of the coolest, smallest boards we’ve ever seen! Fun! This project was intended as a challenge to fit as much useful circuitry as I could onto a tiny, strange form-factor board. Eventually (after some external mechanical design), this can be able to be made into a wearable pin. Atmega32u4 main processor, with schematic and pin numbering borrowed from the Arduino project (with which this project is not affiliated). Reprogrammable over USB. RGB LED Eye: Everything’s got to have some RGB. 6-DOF IMU (LSM6DS3): 3-axis Gyro and Accel, communicates over I2C. Common library support available. Bluetooth Low-Energy: BlueNRG-MS chip, with a BLE antenna on the rear leg. Lithium-Ion Polymer Battery powered: Main logic is powered by a boost from battery voltage to 5V. USB feeds an on-board battery charger to charge the battery. The main boost has a true-off mode so when it’s disabled, it draws extremely little current, for long battery life. The intention when this is actually made into a wearable pin is to use the closing of the pin itself into the enable circuitry. Absolutely Tiny: I mean, look at the photos! I’ve designed a variety of fun hobbyist electronics projects before that used the Arduino platform. As mentioned above, the way I made this project fun for myself was to try to cram as much circuitry as I could into a tiny, strange form-factor. What resulted was using every facet of extended manufacturing capability provided by Macrofab (3/3 traces, 4 mil vias) plus one feature that wasn’t listed online (epoxy filled vias, since I had to do via in pad for the BGAs). The giraffe is documented here. Demo video of the 6DOF + RGB LED eye here. Github repo here. Screenshot of the layout in case you want to take a look but don’t have Circuitmaker installed.